This heavy duty coat is a nice weatherproof brown though it sometimes looks blue. It has two vertical zipper pockets in the front and a high collar. It looks warm! 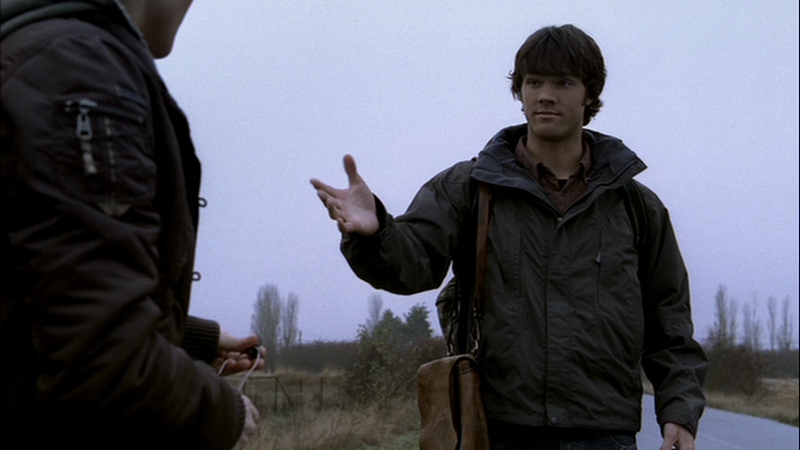 It first appears (along with Dean’s Winter Coat) in Scarecrow (1x11), when Sam decides he is going off on his own to find his father. Sam wears it for almost the entire episode (excluding the first scene in the motel room), only taking it off while he is lounging around the bus station with Meg, and for the final scene when he and Dean see Emily off at the bus station. In Faith (1x12), Sam starts wearing it when they arrive at the Le Grange’s in Nebraska, only removing it while researching in the motel room and during the closing scene. In Route 666 (1x13), Sam starts wearing this warmer jacket once he starts investigating deaths in Girardeau, Missouri, and keeps it on for the rest of the episode – except when he changes briefly into his suit, and when getting the necessary back-story from Cassie’s mother inside her home over tea. FATE: Unknown – but I believe that Kripke decided that the boys being warm somehow made them look less badass.